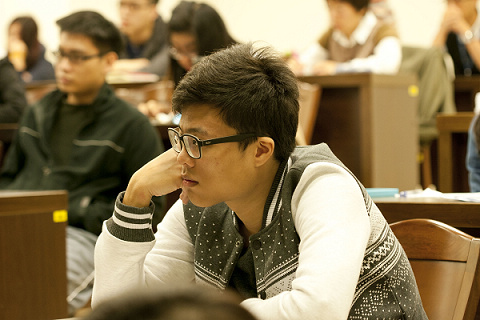 The persistence on English-taught courses on Lanyang Campus has been widely acknowledged in Taiwan. These English-taught courses were also rated as highly-recommended courses by the Ministry of Education. Acknowledged by the Ministry of Education, all departments on Lanyang Campus has been sanctioned to have Engllish-Taught Program added to their original titles, including Dept. of English Language and Culture (English-Taught Program), Dept. of Global Politics and Economics (English-Taught Program), Dept. of Innovative Information Technology (English-Taught Program), and Dept. of International Tourism Management (English-Taught Program). To conform to this key feature, the faculty of all departments consists of a number of foreign professors and a number of the faculty receive their doctorates abroad. All prospective teachers will be required to demonstrate teaching and have an interview both in English. All faculty members are also encouraged to participate in all workshops on teaching in English to advance all faculty members ‘ competence and skills in teaching in English. As a result, faculty members on Lanyang Campus generally receives excellent teacher ratings from students each semester. With the steady growth of English-taught courses, the Future of International Tourism English-Taught Program and the Culture and Future Tourism English-Taught Program were launched in the spring semester of the 2014 academic year. Students joining in these programs will be advised to do internships with corporations or companies overseas and will be able to broaden their horizon and develop in themselves global mobility.